6/4/13 - Acquisition - Bordeaux, Musée des Beaux-Arts - During the Christie’s auction this afternoon, the Musée des Beaux-Arts in Bordeaux pre-empted a large sheet by William Bouguereau for 9,000€ (before charges) (ill. 1). This is a preparatory work for the figure of Hercules for the ceiling of the foyer at the Grand Théâtre in Bordeaux. The city commissioned Bouguereau in 1865 to do the work which was completed four years later in 1869. The artist painted a canvas which was then "maroufled" onto the ceiling. The choice of subject was left up to the painter who was simply to respect the rather elongated oval form. After considering several themes surrounding Apollo and the Muses, Bouguerreau finally settled on Apollo Descended from his Chariot Takes Up his Lyre ; the Gods Get Ready to Listen. Hercules can be seen on the extreme left side of the composition. This drawing had been shown during the retrospective highlighting the artist organized at the Petit Palais in 1984 . 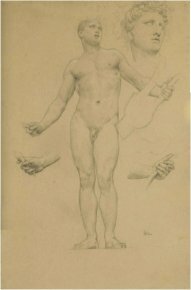 Another preparatory sheet for the figure of Apollo (ill. 2), which was also part of the exhibition, was on offer as well at Christie’s, along with a study for Cupid (ill. 3) which can be seen on the right side of the ceiling with Venus. All of these other drawings, alas for the museum, rose far over their estimates thus probably explaining why the establishment was not able to acquire them also. Bouguereau is still highly appreciated, notably by Americans, no doubt the reason for the lofty prices compared to other academic artists like him. Our information concerning the commission to Bouguereau and the theater ceiling is drawn from this catalogue and the research done by Georges Brunel.